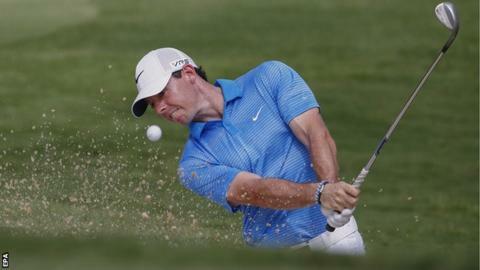 Rory McIlroy moved into the joint lead after shooting a third-round 67 in the Tour Championship. Overnight leader Billy Horschel of the United States carded a 69 to hang onto a share of the advantage. Victory for either Northern Ireland's McIlroy or Horschel at East Lake Golf Club in Atlanta would also secure the overall £6m FedEx Cup title. Jim Furyk is within two shots of the lead and Jason Day, Justin Rose and Rickie Fowler are a further shot behind. "I felt a little weary coming into this week and by no means have I played my best golf, but I'm tied for the lead and I couldn't ask for any more," McIlroy said. The world number one had three birdies on the front nine and then sank a long eagle putt at the 15th. The United States' Chris Kirk, the current leader of the FedEx standings, had a poor day as a round of 71 dropped him from a share of second to tied seventh. But 2010 FedEx Cup champion Jim Furyk shot a solid 67 to close to within two strokes of the lead. McIlroy is bidding for his fourth tournament victory of the season, having already won the Open Championship, the Bridgestone Invitational, and the PGA Championship.